During their monthly meeting Monday, Williamston Town Council tabled second reading on the 2016-17 budget and approved several zoning related items and a resolution requesting help to fix a road problem on Minor Street. Just before addressing the budget, Council also went into executive session to receive legal advice from the town attorney related to a recommendation for last minute changes in the budget. Upon returning to open session, a vote on the budget was tabled after Mayor Mack Durham expressed concerns about last minute changes which he said had been presented to him that afternoon. Councilman Rockey Burgess requested changes in the ordinance to adopt the budget that would restrict the transfer of appropriations between line items for salaries or any transfers greater than $10,000 between line items or departments. Other proposed budget amendments include decreasing the Admin salary budget by $45,000 and transfer to the street department; place two limb grinders on a government deals auction site and place any proceeds into the purchase of a front-end-loader tractor; Reduce Community Support line itme from $8,000 to $3,000 and reallocated $5000 to nuisance abatement. Also remove Main Street Challenge funding of $10,000 and reallocate to Message Board; remove Art Murals $3000 and appropriate to Depot Matchng Funds; decrease Howdy Day funding from $2,500 to $500 and reallocated $1,000 to Depot Matching Funds and $1000 to Walmart Strategy (banners); reflect rental income of $6,000 from the Palmetto Cultural Arts Center for May and June and allocated those funds to the General Fund Contingency. Envision Williamston budget requests prior to the June 13 meeting included: Electronic message board $32,500; Main Street Challenge $10,000; Art mural $3,000;, Walmart Business Strategy (banners) $2,000 and funding for a Hands On Williamston Day Yall (HOWDY) cleanup day, $$3,000. The Town is also budgeting $30,000 for a matching grant for a Depot renovation project. Funding for the depot renovation and the Envision Williamston projects will come from the Hospitality Tax fund. A budget work session has been scheduled for Tuesday, June 21 at 7 p.m. at the Municipal Center. In other matters, Council unanimously approved second reading on an updated zoning map. There was discussion about how to handle updates to the map when zoning changes or annexations are aproved by council. Town Attorney Lee Cole said the map is referenced in the town’s zoning ordinance which is “currently in use” and includes the most recent approved annexation and zoning chages. Council unanimously approved second reading on a change in zoning for property at 304 Beaverdam Rd. The property was rezoned from Residential (R1) to Highway Commercial (HC) with residential zoning remaining on tracts of the property on Glendale Avenue. Changes to the town’s sign ordinance were also approved. Councilman Otis Scott asked if the changes in the sign ordinance would affect the proposed Walmart. The town attorney said it would not because plans were already approved for the project. Council unanimously approved second reading on notice requirements for any changes in the zoning ordinance or zoning map. Council went into executive session to discuss a potential contract regarding a property purchase. No additional details were made public. Upon returning to regular session, council approved adding Postell Lewis and Beth Wilson to the town’s Zoning and Appeals Board. Council unanimously approved a resolution requesting assistance from the Anderson County Transportation Committee (ACTC) for work to replace a culvert on Minor Street. Council approved a request by Unity Mortuary for funding to help with a back to school event in July. Councilman Tony Hagood said the Unity in the Community Back to School Blast will be held in Mineral Spring Park on July 15 from 5 pm to 8:30 pm. The event is being sponsored by Unity Mortuary and Williamston Police Department. It will include free bounce houses, face painting and other activities including back packs and school supplies for area children. Council approved $500 for the event. During the meeting Envision Williamston Executive Director Sonya Crandall reported the program has been very active in promoting upcoming festivals and events with posters and rack cards and is in the process of having three billboards placed in strategic locations in the area. The advertising reflects branding of the town developed as part of the Main Street program and directs visitors to the Envision Williamston website at www.envisionwilliamston.com for information. Seven members of the EW board were in attendance. Council also heard concerns from a citizen about the youth facility being located on Williams Street which was followed by a presentation of information by representatives of the faciltiy. 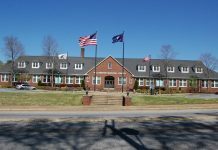 The old Williamston hospital building on Williams Street is being renovated for the facility which will be known as the Williamston Youth Academy.